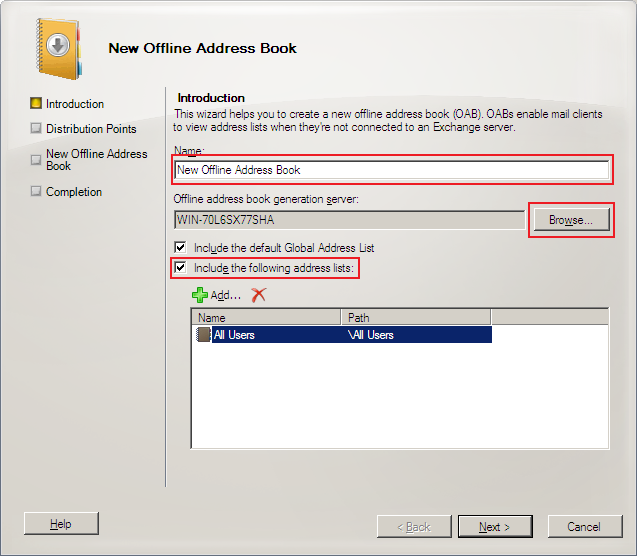 This article explains how to create a new Offline Address Book (OAB) on Exchange Server 2010. The Offline Address Book is an offline copy of all the email addresses within Exchage Server. Users of Exchange can download the OAB and save it on their computers, so they have access to the address abook even if Exchange Server is offline. The Offline Address Book can be created by server administrator, and he \ she decides which addresses or information is accessible to Exchange users. To create a new Offline Address Book follow the steps below. 1. Open Exchange Management Console > Organisation Configuration > Mailbox > Offline Address Book tab. 2. Right-click on the blank area, and select New Offline Address Book. Fig. 1. Creating a new Offline Address Book. 3. In the new window choose a name for the new offline address book, and select which addres list, or indvidual contacts you would like to make available to users. The image below shows the name field, location and selected contacts available to Exchange users. Fig. 2. Selecting name, location and contacts in the new Offline Address Book. 4. 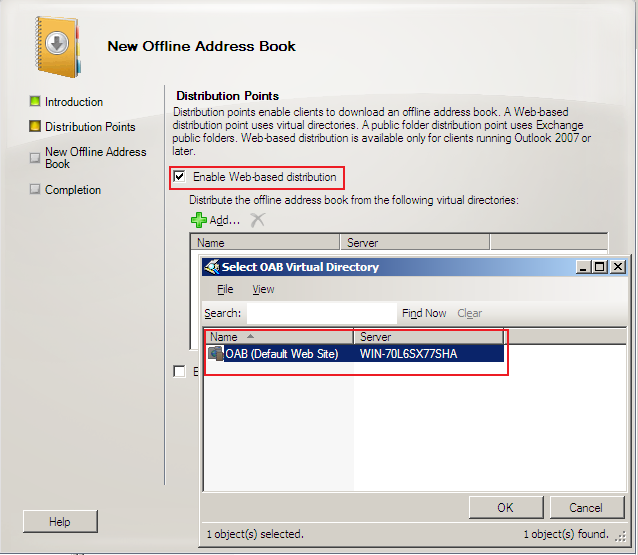 In the Distribution Points page select Enable Web-based distribution – if your users are running Office 2007 and up. In this case the OAB will be distributed from a virtual directory, by clicking Add button you can virtual directories that will distribute the OAB. If your users are running Office 2003, select Enable public folders distribution. In this case the OAB will be distributed from a public folder of Exchange Server. In this scenario Web-based distribution is selected. Fig. 3. Distribution point selection. 5. Once all the settings have been selected, it’s time to review them. If everything is in order, clicking New button will create a new Offline Address Book. Fig. 4. Reviewing OAB settings. 6. Once the new Offline Address Book has been created, you can set it as the default one right-clicking it and selecting the appropriate option from the drop-down menu. Fig. 5. Setting the new Offline Address Book as the default one. From now on the newly created Offline Address Book will be available for Exchange users after it is generated by the Exchange Server, in accordance with the schedule set. The default time for generation is daily at 5:00 AM. Very useful information about the offline address book. Thanks for it. Can any one explain me the purpose of Offline Virtual Directory please?